Barrick Gold, acknowledged as one of the world’s most unethical companies, is in the Top 10 International Holdings of GESB Super’s ‘Balanced Conservative’ and ‘Growth’ plans (as at 31/03/11). 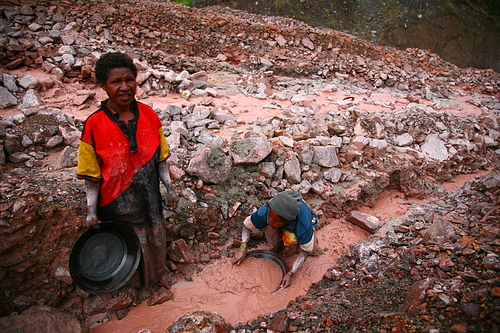 Barrick is the largest gold miner in the world, and has been the subject of many documented studies of human rights abuses and environmental devastation globally, including in Australia, Papua New Guinea, Philippines and Tanzania. Friends of the Earth International has backed calls from communities around the world for a halt to the Canadian mining company’s ‘destructive practices’ in Papua New Guinea and other countries. Campaigners were present at the company’s recent annual general meeting and joined a protest rally outside the meeting venue in Toronto. Friends of the Earth International calls in to question the necessity of the Canadian-owned corporation’s gold mining operations. With the vast majority of gold used for jewellery, Barrick’s gold mines on average use more water than the entire bottle water industry in Canada, and this water is polluted with mining waste products such as cyanide, mercury, arsenic, cadmium, selenium, and sulphides. Last year, the Norwegian Pension fund divested $230 million from Barrick for “ethical reasons”, especially related to their mine in Papua New Guinea. And when Swiss Research firm Covalence compiled both quantitative and qualitative data spanning seven years and 581 companies they listed Barrick as the 12th least ethical company in the world. Natalie Lowrey, from Friends of the Earth Australia, who was at the annual meeting and joined the rally outside, said: “In Australia, Barrick has desecrated an ecologically and culturally significant site on Wiradjuri lands with an open-pit mine in the bed of Lake Cowal within a flood plain. Many JustInvest clients have given themselves peace of mind by choosing to invest according to their ethics. To learn more about investing ethically in your Super portfolio, talk to us today.